Can I get a small sample to make sure the Super-Seal 25 is what I want? If you call the office you can order a sample(s) for $8 each that includes shipping. Only one coat is needed of the SS25. Do not backroll. It applies at 100 sq feet per gallon. Sorry but 1-gallons will not ship free. Only 5-gallon pails. As for the sprayer, that would be more of a question for Hudson and if it can handle a sealer that is 25% solid content. In October 2016, after power washing, I applied Super Seal 10 to my one year old brushed concrete driveway. Applied with roller in warm summer weather, without any problems. I now have what appear to be large unsightly yellow streaks or lines throughout the concrete. They appear to be roller marks? I am sure I put on a generous coat of product. Need to do something to remove these marks and reseal the concrete. Looks almost like the product was absorbed into the concrete in some areas and not others. How do I proceed? Thank You. I am sorry but we do not sell or have ever used the Super Seal 10 so not sure what caused it. As for fixing, a picture or two would help determine if we can help with this. If closed and stored in a temperature controlled area, it will last 12 months, maybe longer. 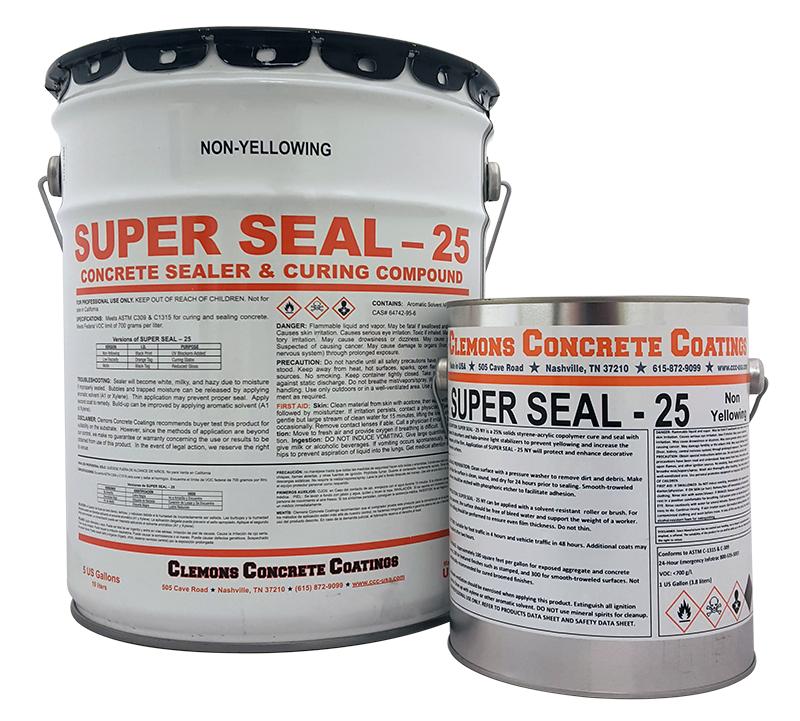 Can you tell me if superseal25 is available to be shipped to Connecticut. If not, what would you recommend? My #1 pupose of sealing my pavers is to darken them (wet look). The area that will be treated is a large pool patio. I am sorry but never heard of Sonaborn Curing @ seal. Do you know the chemical makeup of it and has it turned white or yellowed in discoloration? Customer has a stamped patio that was sealed with Sonaborn Curing @ seal. What do I need to do to reseal with super seal? I applied a water-based acrylic stain and sealer to my concrete patio today. I would like the patio to have a wet-look appearance. Can I apply Superseal25 Semi-Gloss on the patio over the water-based stain and sealer? If so, how long should I wait to apply it? If not, what is the best water-based sealer to use to give the darkened, wet-look appearance that I desire. 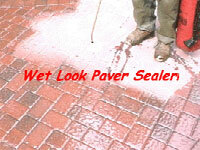 It should not be slippery unless you have a buildup of old sealer on the pavers. It mat be a little slippery for the first 1-2 weeks until full cure. 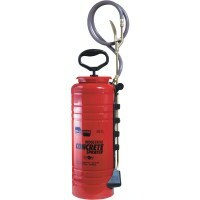 You can also add our Super Grip for traction if you would like. Will the SuperSeal25 Semi-Gloss make my pavers around my Florida pool deck slippery when wet? Is there a better sealer that will bring out the color, and still not be slippery? If using the same sealer then just prep by cleaning with water. Let dry for 48 hours before sealing. I have a stamped patio that was sealed 2 years ago. It is time to reseal it this spring. I wanted to know if there was any special prep that needs to be done to cover the existing sealer that still remains. Let me try to explain it better. The overall color of the patio is not uniform whether it's dry or wet. I think it's designed that way to simulate natural rocks. The flat and smooth areas are lighter in color and the rough/wrinkled areas are darker. After I had the incident with the basement flooding, the bleaching effect from the basement water made the color to fade more on smooth/flat areas of the patio, while the rough/wrinkled areas of the patio retained more colors. To answer your question about the colors when wet: when the patio gets wet, the darker areas gets darker, the faded areas also gets a little darker, but the increase of darkness is less for the faded areas than the darker areas. I don't want to go through the trouble to add color to the sealer, and I will accept the fact that the faded areas will always be this way. It's not really too bad because stones in nature never have the same uniform color anyway. I just want to make sure I have the right kind of sealer to protect the surface and hopefully not make the fading worse. Thanks. Does it look uniform though when wet with water? When the patio is wet, the colored areas definitely gets darker than the faded areas. When wet with water does everything look evenly darker in appearance or do those areas still stand out? I live in Buffalo, NY area. The patio was done by the previous home owner 8 years ago when the house was built. We bought the house 4 years ago and never did anything, due to ignorance and laziness. Now I start to notice fine spider-web like cracks on the surface, which seemed to indicate freeze/thaw damage. I hope it's not too late to seal. By the way, I don't know the previous owner ever sealed it or not. Even if he did, after 4 years, all traces of sealer are probably all gone now. The patio has “stone texture” finish, i.e. an uneven reddish color with wrinkles and rough ridges on the surface to simulate the natural stone surface. 4 years ago, shortly after we moved in, we had a failed sump pump and flooded the basement. We had lots of cardboard boxes and plastic bins yet to be unpacked from the move. They all got wet. I moved them out of the basement and laid on the patio to dry for a couple of days. Right after that, I noticed that the color of those areas where those boxes and bins sat on, began to fade. It's almost like the basement water had some type of bleaching effect to the patio surface. Since the color of the concrete was uneven to begin with, those faded areas didn't look too bad. So, with this background info, my questions are: what's the best sealer to use, and would the sealer make those faded areas look better (by darkening them) or look worse (by darkening the other non-faded areas more)? Thank you. This will not work and we do not have anything that will for a fountain. Is this product good for sealing the inside of bowls of a fountain. If not what do you recommend? We do not have a sealer that will 100% seal what you are trying to do. I do not think it is possible either. There is a bedroom under the deck down staris , that has water damage from a slow leak from the roof tiles above it. and the sheet rock is bubbleing and getting detroyed after a 2 yrs of slow water pentration . Yes but we do not offer the tints on this site. Please do a search for: "Super Seal Tints" in Google. Can I color tint with the super seal 25 product and if so what should I use? 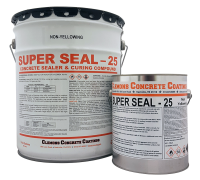 SuperSeal25 is a solvent based sealer that penetrates and sits on top of the surface slightly. I work at matthew knight arena in Eugene Oregon. We are thinking about doing a repolish on our main concourse and are looking for a good possible water resistant sealer that is food service compatible. You cannot "fix" the old sealer's slipperiness by adding a sealer on top. You would need to strip all of the old sealer off and start over. Another option is to add SuperGrip ([url]Super-Grip.html[/url]). This is an additive for the SuperSeal25 that increases traction. I have stamped patterned concrete around a swimming pool. In the past I used professional and the sealants went on too thick and filled the crevices and make it too slippery when wet. I am looking to do it myself this time. Do you have a recommendation for a product that will provide protectiopn to the concrete without making it too slippery.